For solitary neighbors Bunny and Dog, reticence overcomes curiosity — until something extraordinary happens to nudge them into friendship. 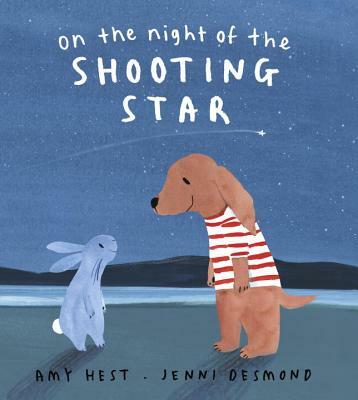 Amy Hest is the author of many beloved picture books, including Kiss Good Night, illustrated by Anita Jeram; Charley’s First Night and When Charley Met Grampa, both illustrated by Helen Oxenbury; and Are You Sure, Mother Bear?, illustrated by Lauren Tobia. Amy Hest lives in New York City. Jenni Desmond is the creator of several picture books, including The Polar Bear, The Blue Whale, and Red Cat Blue Cat. She is also the illustrator of The First Slodge by Jeanne Willis. Jenni Desmond lives in London. Hest’s spare, quiet text, with just enough well-chosen details to set the scenes and differentiate clearly between Dog and Bunny, leaves plenty of room for the illustrator’s imagination...While many stories about making friends begin with a lonely characters yearning for companionship, this picture book introduces two who are content to be alone, but find that friendship brings them great happiness. A wonderful read-aloud choice. Desmond's mixed-media illustrations juxtapose simply rendered animals, charming household details, and lovely full-bleed expanses of starry sky and moonlit lake. A gentle, empathetic tribute to the value of reaching out to welcome a new friend. Enchantingly fresh, this lighthearted tale of friendship deserves a place in every picture book collection. Pair with Beth Ferry’s Stick and Stone or Cynthia Rylant’s “Mr. Putter and Tabby” series for stories that inspire kindness and neighborliness and that value the warm comfort of finding a friend. The appealing watercolor illustrations create a welcoming world and two lovable characters.